The peaceful Olive House was designed and built in 2005 by a renowned Athenian architect on the popular island of Paros in the Cyclades. 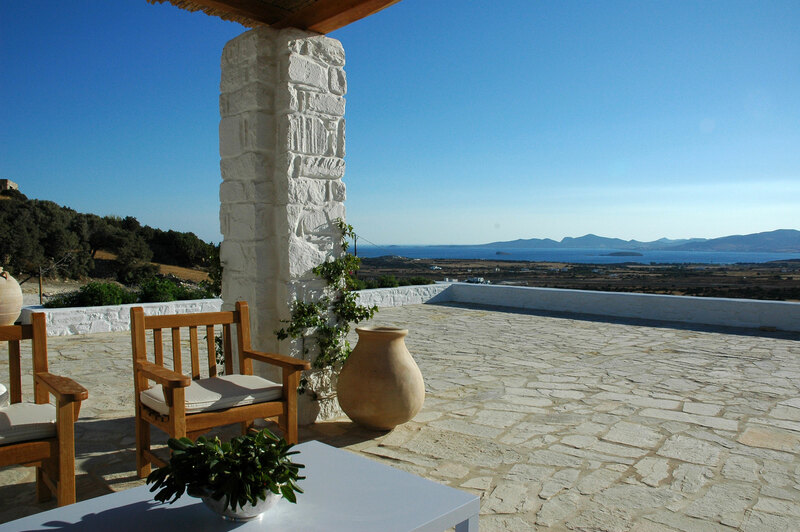 The stunning villa is set into a hillside with sweeping views of rolling fields, the islet of Antiparos and the open Greek sea. The villa combines the best of Greek traditional living with super-comfy modern conveniences, and the terraced hillside is filled by an abundant flowering garden. The three-bedroom villa, located approximately 5 km northeast of the seaside fishing village of Alyki, was designed as a classic island home with contemporary flair and comfortably sleeps six. Light and airy, the house has an inviting open floor plan, and is surrounded by wrap-around terraces. The space flows beautifully from the verandas with their various dining and lounging areas, to the interior shared living spaces and bedrooms. The huge veranda facing the sea is easily accessible from all of the rooms connecting to it, and the interior is kitted out with all of the modern conveniences from wifi to top-notch kitchen appliances and air conditioning and heating. With three bedrooms and three full baths, the Olive House sleeps six very comfortably (in 2 queen beds and a pair of twin beds). Cribs and toddler beds can be provided upon request – the house is very family-friendly. In a pinch, the villa can accommodate eight or nine guests – as additional sleeping space is available on mattress-style sofas in the sunken living room. The master suite offers a luxurious oversized bathroom with a soaking tub for two and breathtaking views of the sea. The furniture at Olive House is a mixture of comfortable modern pieces and carefully chosen antiques. 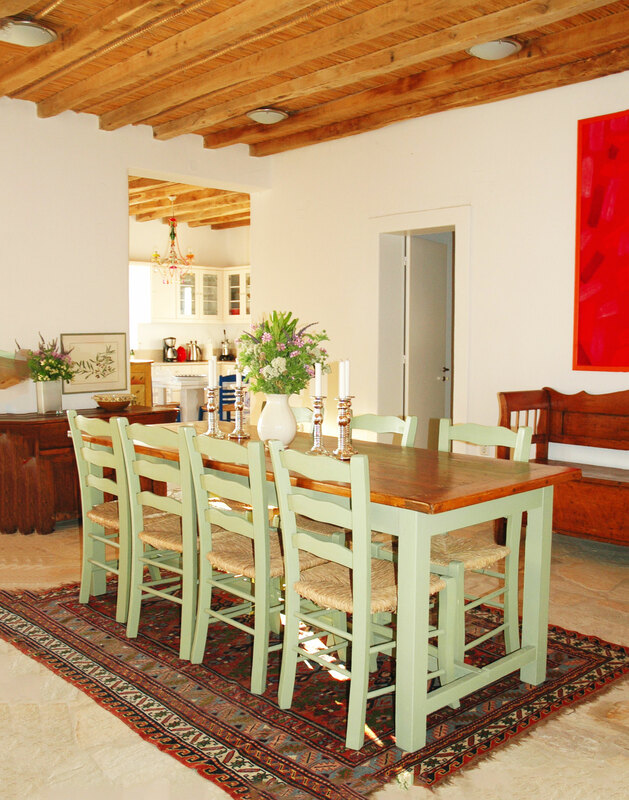 The house has a fully equipped modern kitchen and an indoor dining table to seat eight. Some of the Olive House amenities include: a flatscreen television, wireless internet access, Bose iPod speaker dock, espresso maker, washer and dryer, built-in barbeque, fireplace, outdoor shower, carport, in-room air conditioning and heating, vast gardens, our own small vineyard, and weekly maid service. The Olive House offers its guests true seclusion and peace, and is surrounded by spectacular lavender and flowering gardens, and a small private vineyard. Visitors are likely to make a habit of sitting out on the vast flagstone veranda with a glass of wine watching the sun go down. Guests can also enjoy the spectacular views while dining outside at marble tables overlooking the Aegean and the neighbouring island of Antiparos. 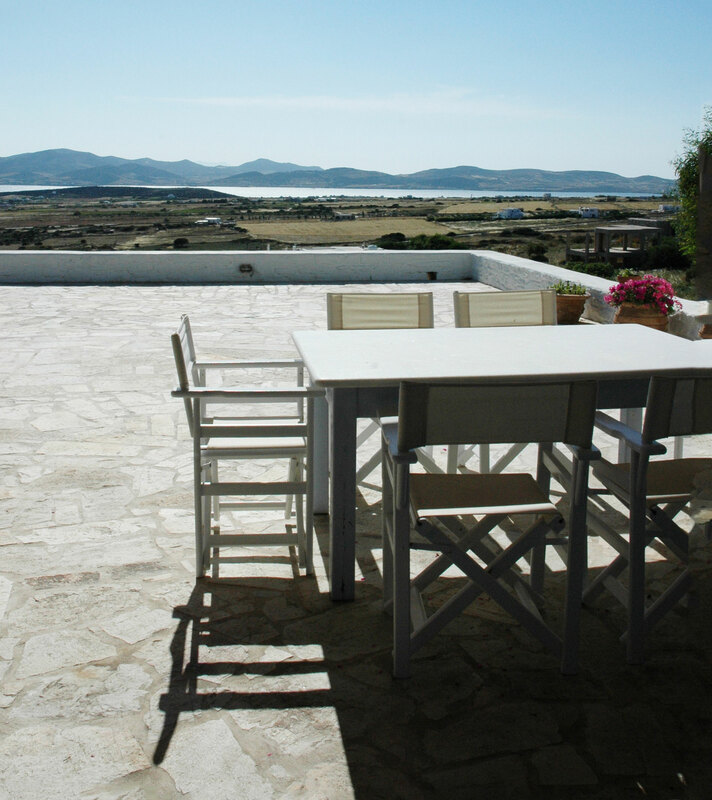 The Olive House is a five-minute drive from the Paros airport and approximately a 25-minute drive from the island's capital city and port, Parikia. Because of the privacy of the home, it is necessary to rent a car during your time with us. 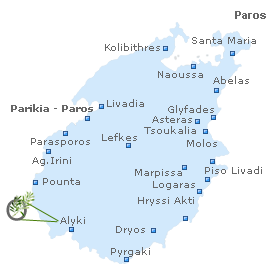 Visitors reach Paros by sea (3½ hours by high speed ferry from Piraeus) or air (25-minute flight from Athens).